This is the second of four dishes. 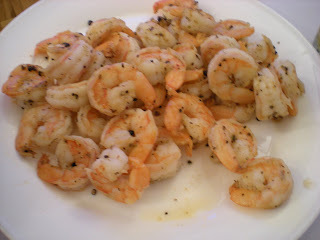 The name is self-explanatory, it is basically shrimp seasoned with salt and cracked peppercorns. Peppercorns are usually crushed using a mortar and a pestle, if you don't have one, put it in a ziploc and crack it using the side of a frying pan. 1. 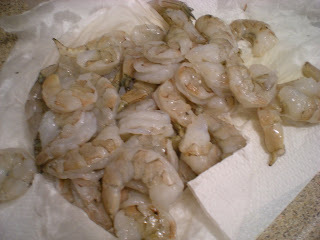 Pat dry shrimps before cooking. 2. In a wok or large skillet, heat oil over medium-high heat. Add shrimp, toss wok to coat. Add red pepper flakes, salt and pepper. 3. 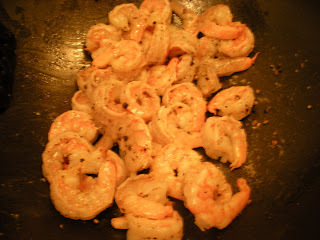 Toss until shrimp have turned pink and curled, 2-3 minutes. Serve immediately.